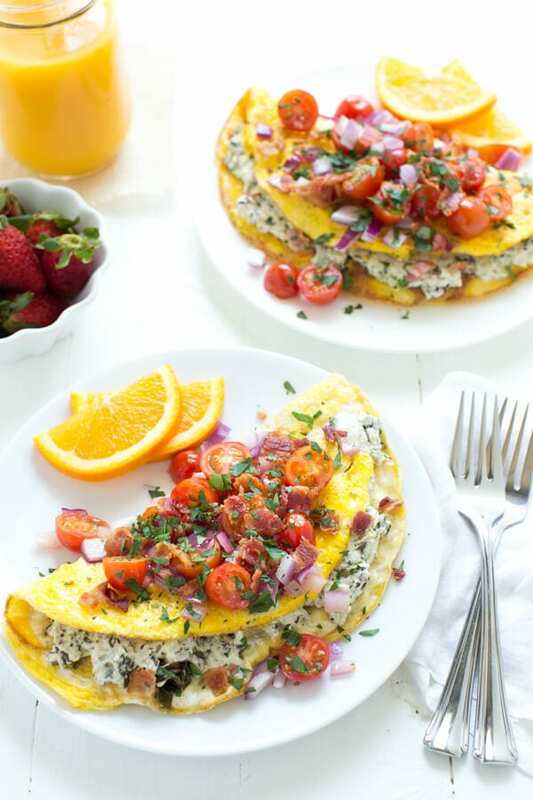 A delicious omelet made with spinach and kale dip, tomatoes, bacon and onions! Enjoy a hearty meal for breakfast or brunch and fuel up for the day ahead. The weekends are made for brunch! Brunch is also a great way to procrastinate. I’d rather eat brunch any day than work on my growing list of to-dos. For the past few weeks, I’ve been motivated to get all of the things done that I put off during the cold winter. 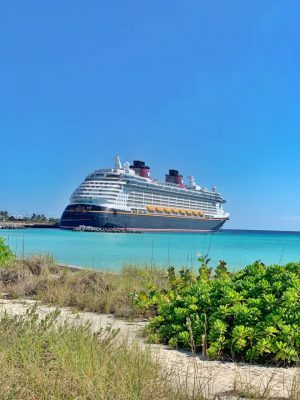 Each week, I make a list of things to do that mostly includes some spring cleaning, errands, taxes and projects around my house. 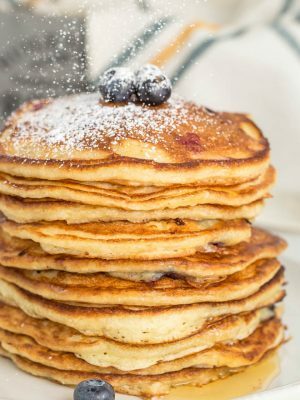 I am motivated to tackle my list yet each weekend when Saturday rolls around I always find an excuse to delay my list of projects by enjoying a hearty brunch instead. 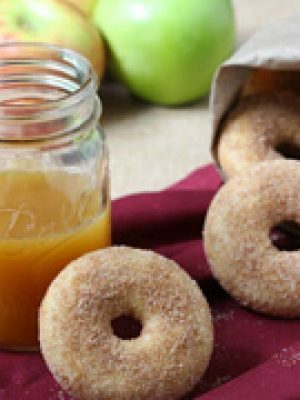 After all, you can’t start a daunting list of to-dos without a nutritious breakfast. First on my menu is this Ultimate Kale and Spinach Omelet with Tomatoes and Bacon. For this recipe, I used my favorite La Terra Fina Spinach and Kale Spread. 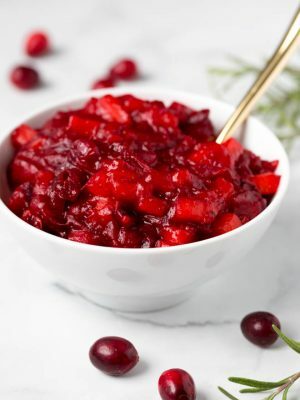 I love the spread because it is thick, flavorful and versatile. 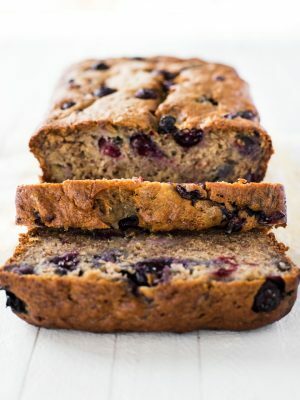 It is made with Greek yogurt and parmesan cheese. After the omelet is set, add a few tablespoons of the dip and heat until warm. 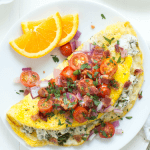 Fold over the omelet and serve with the sautéed tomatoes, onions and bacon. I really enjoy the flavor combination in this omelet. 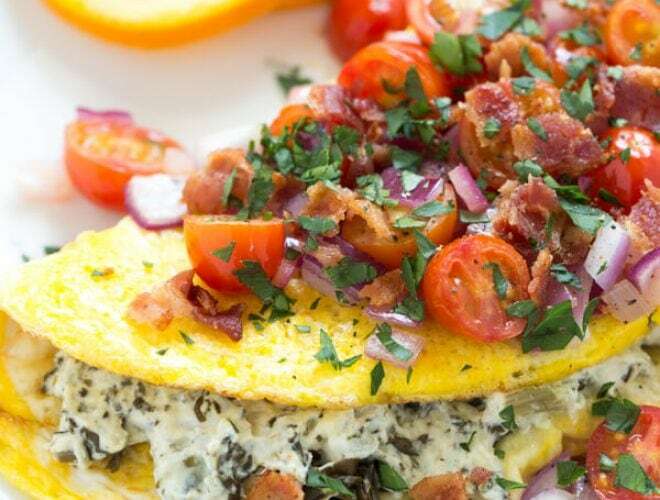 It includes everything that I love about breakfast including fresh tomatoes and onions, a cheesy omelet filling made with greens and crispy bacon. 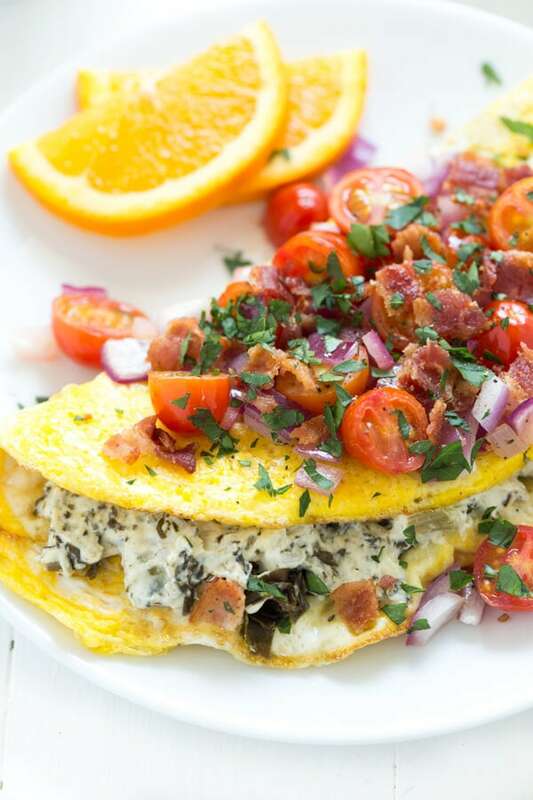 Go ahead, create the ultimate omelet loaded with the best flavors and freshest ingredients! I love to serve this omelet with breakfast potatoes and fresh fruit to create a delicious meal. Heat olive oil in a medium nonstick skillet over medium heat. Add cherry tomatoes and onion. Saute for 2 to 3 minutes or until tomatoes are softened. Add chopped bacon and stir. Transfer mixture to a plate. Wipe the skillet clean with a paper towel. In a small bowl, whisk together eggs. Heat coconut oil in the same medium nonstick skillet. Pour eggs into skillet and cook 4 to 5 minutes or until the eggs are set and the bottom is golden. 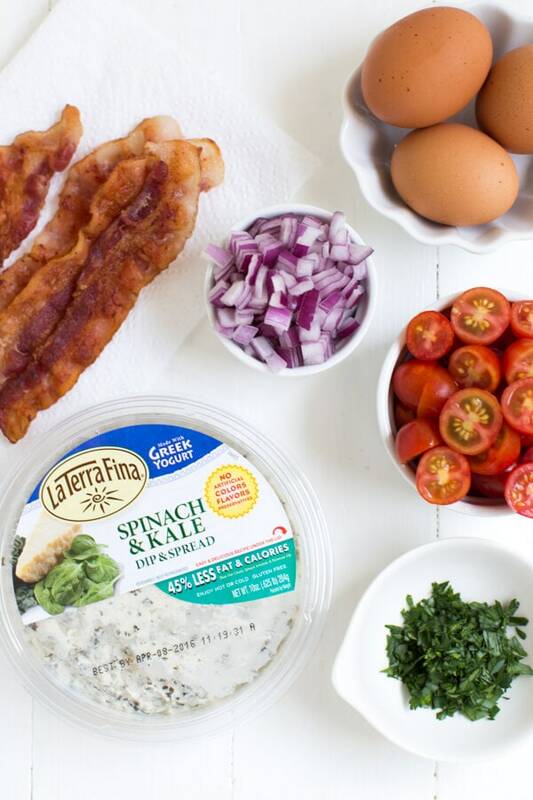 Spread two or three tablespoons of La Terra Fina Spinach and Kale Dip onto half of the omelet. Heat for an additional 30 seconds. Transfer omelet to a plate. Fold over and top with tomato, onion and bacon mixture. Garnish with parsley. Serve immediately. 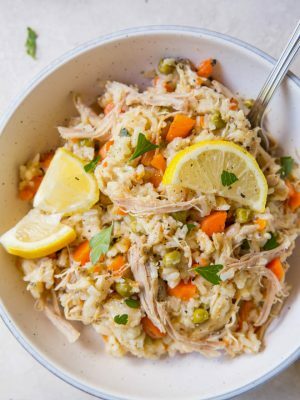 This post was created in partnership with La Terra Fina. As always, all opinions are my own. Never for a second did I ever think about adding yogurt to an omelet recipe! Lovely colors. Looks so healthy and delicious! 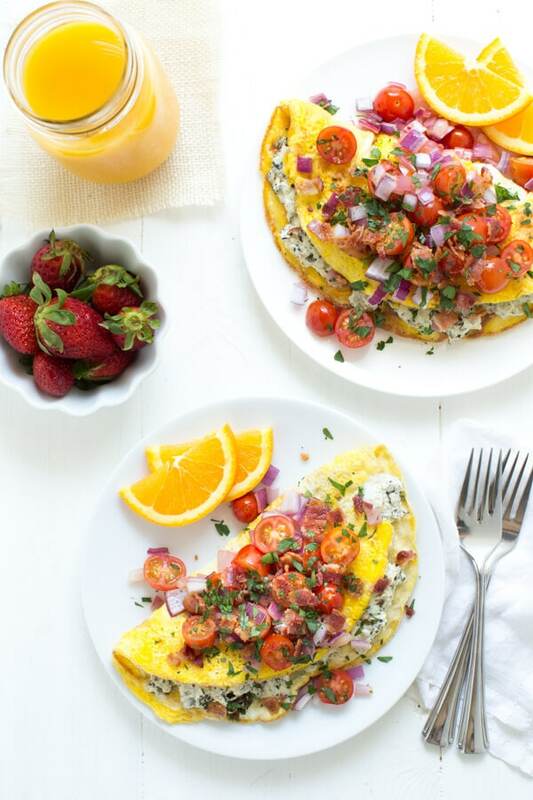 These omelettes looks so beautifully healthy! This is the prettiest omelet ever!! 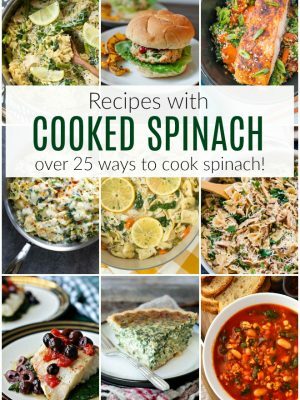 The spinach and kale filling sound amazing and I love the tomato and bacon topping! So gorgeous! WOW! 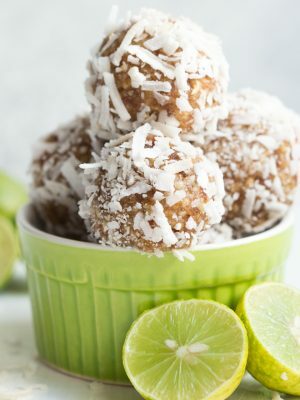 Ashley these look so delicious!! Fluffy, filling and so bright in colour! I love the addition of that spread, sounds so easy to apply and so flavourful. Such a gorgeous and nutritious plate like this would definitely help me get out of bed easier. Lovely omelet! This omelet looks absolutely perfect!!!! I love the combo of flavors you have going on here. YUM!! This is how an omelet should be! Love the spinach and kale in here! This omelet looks like sunshine on a plate. So spring-y, so classic and super delish! Perfect breakfast to start the day off right. 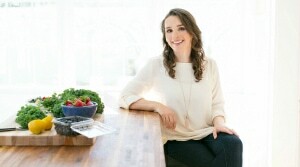 Great way to sneak that healthy greens into the diet! I’m loving all these alternatives!! These omelettes are so stunning! I can't make a pretty omelette for my life- it always becomes a scramble, haha :) But you're inspiring me to try! You put dip IN the omelet? Eeeeekkkk! That sounds so amazing. Must try! I just can't get over how gorgeous this omelet is! All those colors ... gah I love pretty food! haha I have so many things I've been putting off ... I desperately need to organize photos (like not blog ones) and just keep putting it off! Living in not the US, what would a selfmade spinach and kale spread be like? The La Terra Fina dip I use is a mixture of cream cheese, Greek yogurt, spinach, onions, kale, Monterey jack cheese, parmesan cheese and garlic. 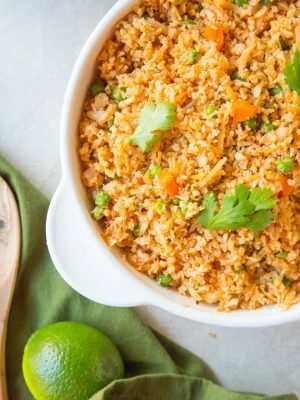 You can make something similar yourself or try to find a similar store-bought dip. Its similar to a spinach-artichoke dip but made with Greek yogurt and Kale and Spinach. I hope that helps! Wow! Ashley this omelet is a beauty! Love the creamy spinach and kale filling and that tomato bacon topping is incredible looking. I can't wait for summer gardening so I can use my tomatoes to make this! I'm in love with kale in my eggs right now. This looks perfect Ashley! Ha! SO TRUE - Brunch IS a great way to procrastinate! Especially if the brunch looks as delicious as this one! LOVING these omelets, girlfriend! That spinach and kale dip (spread) stuffed inside sounds incredible... and the bacon and tomatoes on top are just icing on the cake. errr, garnish on the perfection? Whatever... just hand me 5 of these omelets and call it a day! ;) Pinned! Cheers!